PGA Professional George Mack Jr of Black Butte Ranch won the Senior PGA Professional Championship by four strokes after rounds of 72-68-140 at The Home Course yesterday afternoon. In second place was PGA Professional Mark Keating of Pumpkin Ridge GC. PGA Professional Jim Pike of Sahalee CC placed in lone third. 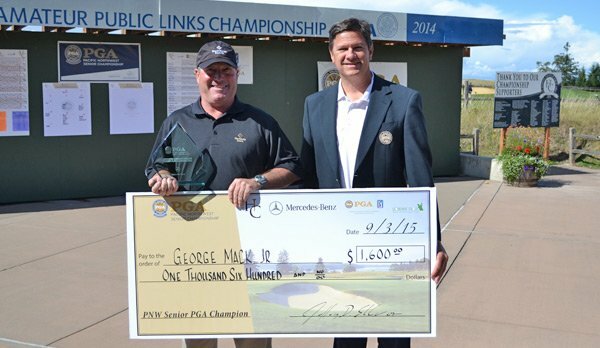 In addition to Mack Jr., Keating and Pike, Rob Gibbons of Arrowhead GC, Steve Stull of Meadow Springs CC, Chuck Milne of Vanco Driving Range, and Steve Prugh of Manito G&CC all earned spots and qualified for the 2015 Senior PGA Professional National Championship that will take place on October 15th-18th, 2015 on both the Bayonet and Black Horse Golf Courses in Seaside, CA. 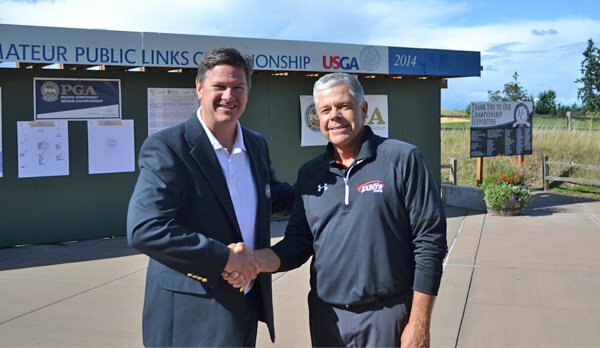 PGA Professional Kevin Bishop of Saint Martin’s University won the Senior Division after scoring rounds of 70-74-144. Doug Gullikson of Meadow Park GC placed second. PGA Professional Julius Jorgensen of Jorgensen Golf won the Senior Division Net Results by four strokes over Ted Wurtz of Port Ludlow GC. Kevin Bishop also captured the Hugh Starkweather award which goes to the low player for both rounds that is 60 years and older. The Senior PGA Professional Championship was established in 1952. This very popular event, for those who are 50 years and older, has seen a major upgrade since the days of old. Some can remember all the way back in 1965 when Harry Umbinetti was the top money winner of the event taking home a whopping $250 dollars. Back then, the championship was held at the Yakima Elks’ Golf and Country Club with only 21 professionals battling it out for the mere sum of $920 dollars. Throughout the 60’s, 70’s, and 80’s, the Pacific Northwest Senior PGA Championship has seen many timeless and popular venues. Places such as Royal Oaks Country Club, Eugene Country Club, Manito Golf and Country Club, and Fircrest Country Club have all been in the mix since the beginning. The famous Bob Duden won the championship six times during the 70’s and seven times overall.